The bloody origins of Labor Day — a holiday carved out from the post-Civil War clashes between workers and employers — have largely faded from public memory. The day off is still a good time relax, but it’s worth remembering the grueling conditions faced by workers before the arrival of protections we often take for granted, like weekends off or 40-hour workweeks. The first Labor Day was Tuesday,September 5, 1882, in New York City. The American labor force has continued to evolve since then, but one of the biggest differences may be who is doing the work. 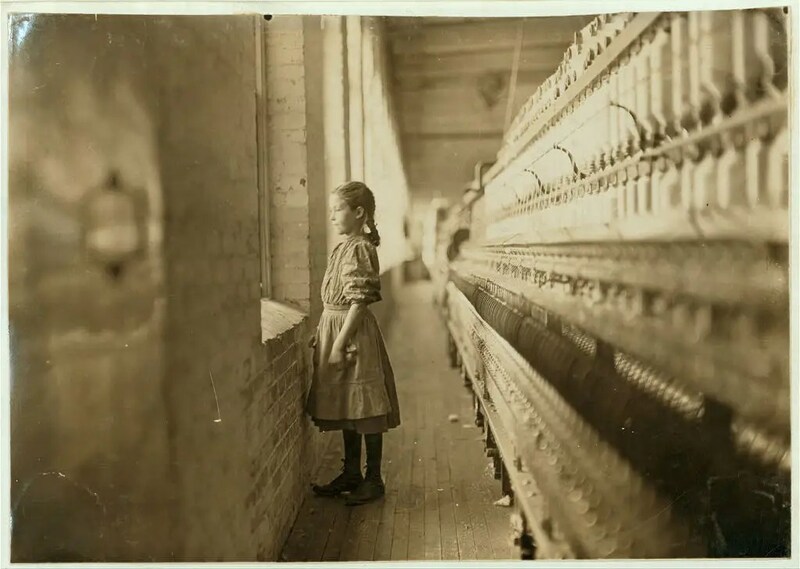 Lewis Hine, a photographer forthe National Child Labor Committee, captured photos of some of the children who made up the US labor force between 1908 and 1924. The photos below, compiled by the Library of Congress, are the result of Hine and the NCLC’s work. The descriptions come from NCLC caption cards, edited for clarity and length. A Glassworks at midnight, taken in Indiana in August 1908. Jewel and Harold Walker, 6 and 5 years old, pick 20 to 25 pounds of cotton a day. Father said: “I promised ’em a little wagon if they’d pick steady, and now they have half a bagful in just a little while.” Location: Comanche County–[Geronimo], Oklahoma, October 1916. Vance, a trapper Boy, 15 years old. 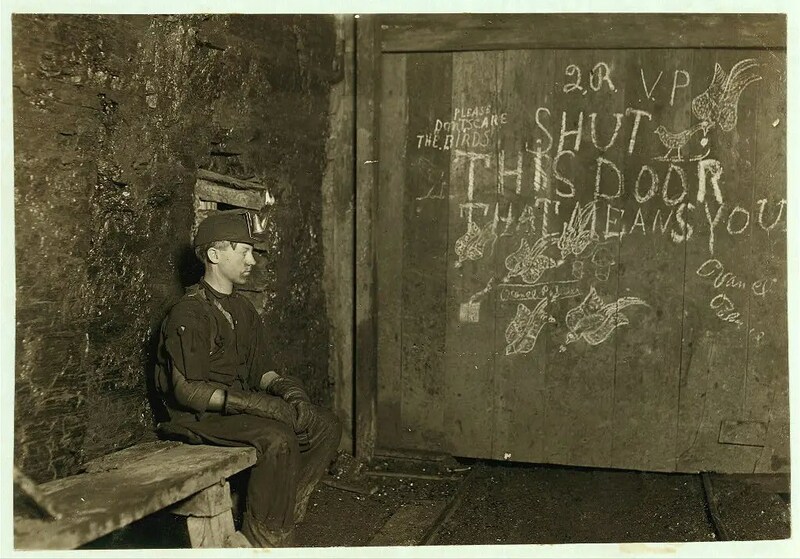 He had trapped for several years in a West Virginia coal mine for $0.75 a day for 10 hours work. All he does is open and shut this door: Most of the time he sits here idle, waiting for the cars to come. On account of the intense darkness in the mine, the hieroglyphics on the door were not visible until plate was developed. Taken in September 1908. 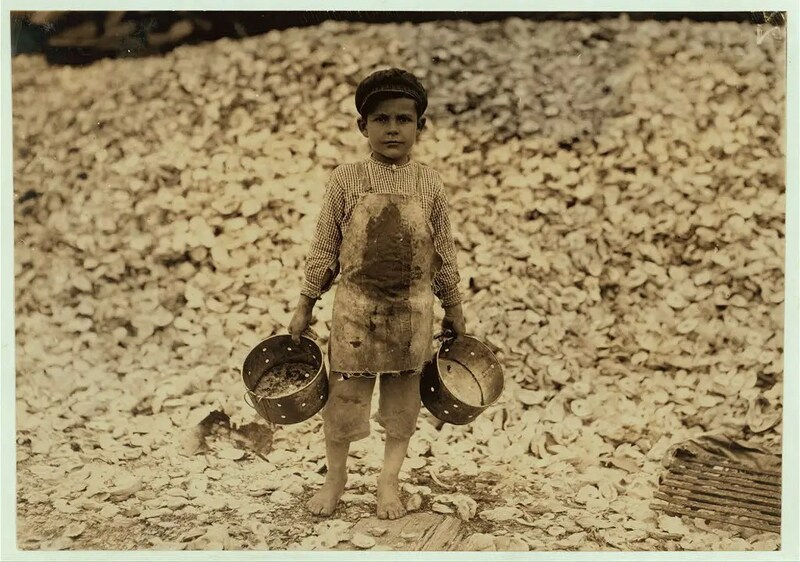 Manuel, the young shrimp-picker, 5 years old and a mountain of child-labor oyster shells behind him. He worked the year before. Understands not a word of English. Dunbar, Lopez, Dukate Company. Location: Biloxi, Mississippi, February 1911. 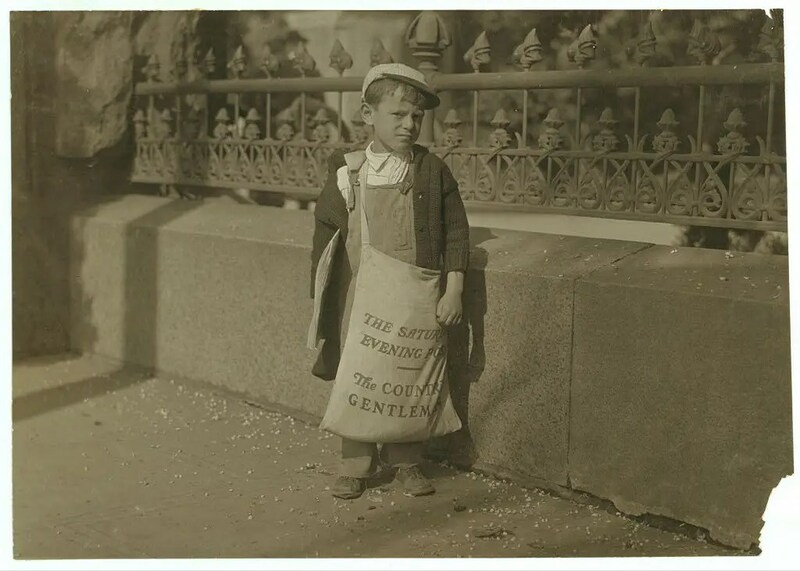 Freddie Kafer, a very immature little newsie selling Saturday Evening Posts and newspapers at the entrance to the State Capitol. He did not know his age, nor much of anything else. He was said to be 5 or 6 years old. Nearby, Hine found Jack who said he was 8 years old, and who was carrying a bag full of Saturday Evening Posts, which weighed nearly 1/2 of his own weight. The bag weighed 24 pounds, and he weighed only 55 pounds. He carried this bag for several blocks to the car. Said he was taking them home. Sacramento, California, May 1915. This little girl, like many others in this state, is so small she has to stand on a box to reach her machine. She is regularly employed as a knitter in a hosiery mill. Said she did not know how long she had worked there. Location: Loudon, Tennessee, December 1910. 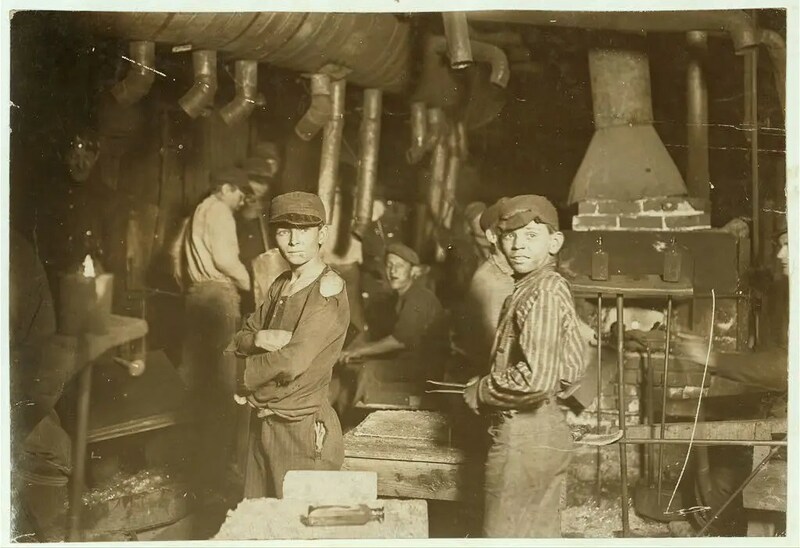 Group of Breaker Boys in #9 Breaker, Hughestown Borough, Pennsylvania Coal Co. Location: Pittston, Pennsylvania, January 1911. Four-year-old Mary, who shucks two pots of oysters a day and tends the baby when not working. The boss said that next year Mary will work steady as the rest of them. The mother is the fastest shucker in the place. She earns $1.50 a day. Works part of the time with her sick baby in her arms. Dunbar, Louisiana, March 1911. Little Fannie, 7 years old, 48 inches high, helps sister in Elk Mills. Her sister (in photo) said, “Yes, she he’ps me right smart. Not all day but all she can. Yes, she started with me at six this mornin’.” These two belong to a family of 19 children. Taken in Fayetteville, Tennessee, November 1910. 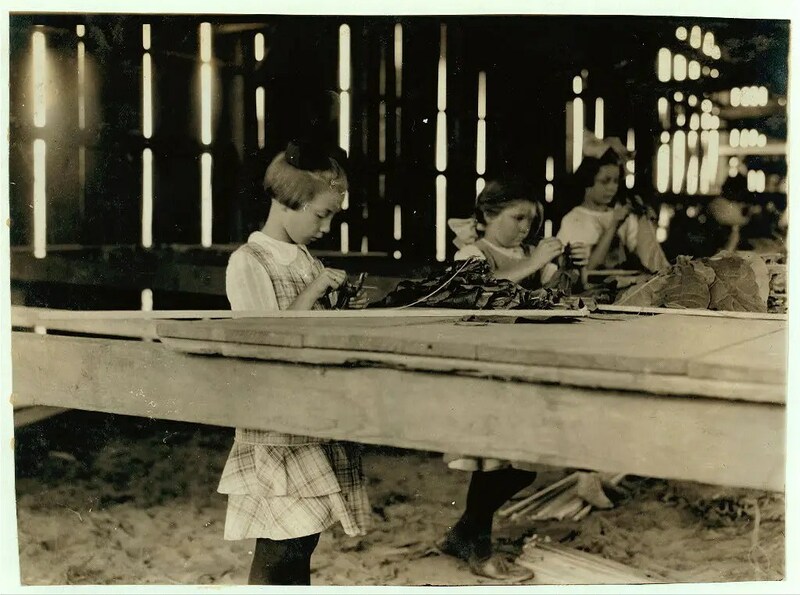 Young cigarmakers at Englahardt & Co., Tampa, Florida. These boys looked under 14. 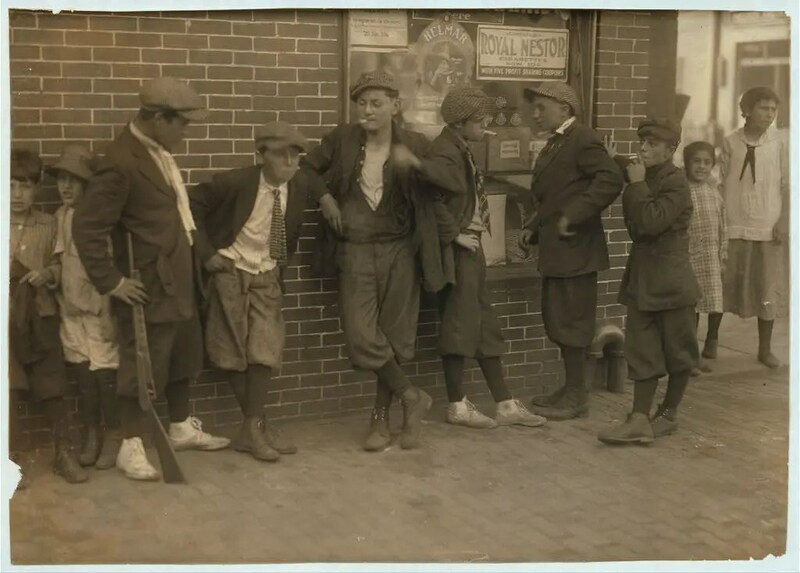 Work was slack and youngsters were not being employed much. Youngsters all smoke. Witness Sara R. Hine. Taken January 1909. 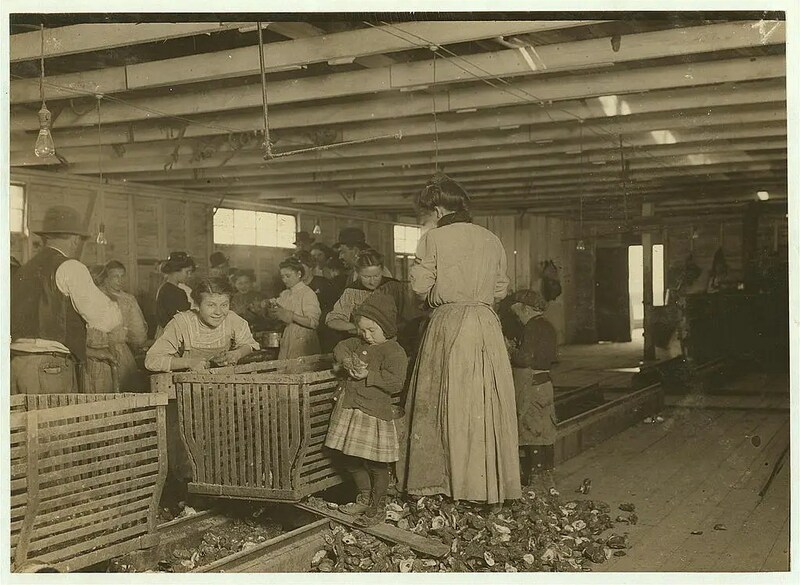 The interior of a tobacco shed, Hawthorn Farm. Girls in foreground are 8, 9, and 10 years old. The 10-year-old makes $0.50 a day. Twelve workers on this farm were 8 to 14 years old, and about 15 are over 15 years. Location: Hazardville, Connecticut, August 1917. A spinner takes moment’s glimpse of the outer world. She said she was 10 years old and had been working over a year. Lincolnton, North Carolina, November 1908. 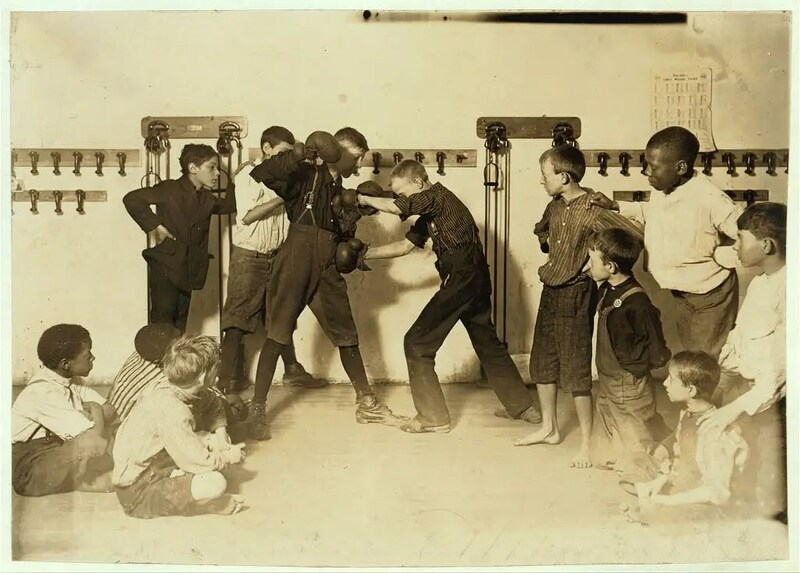 The “Manly art of self-defense” Newsboys’ Protective Association, in Cincinnati, Ohio, taken around 1910. 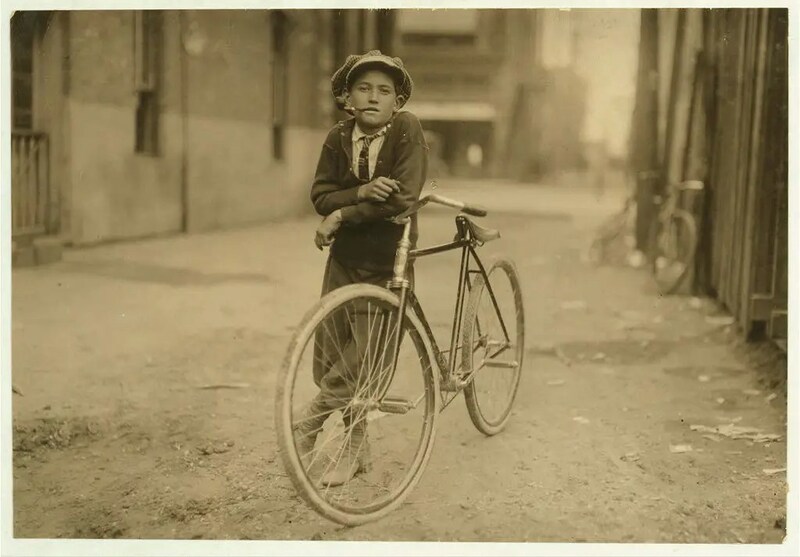 Messenger boy working for Mackay Telegraph Company, said to be 15-years-old, Waco, Texas, September 1913. Street gang, corner of Margaret & Water Streets – 4:30 p.m. Location: Springfield, Massachusetts, June 1916. 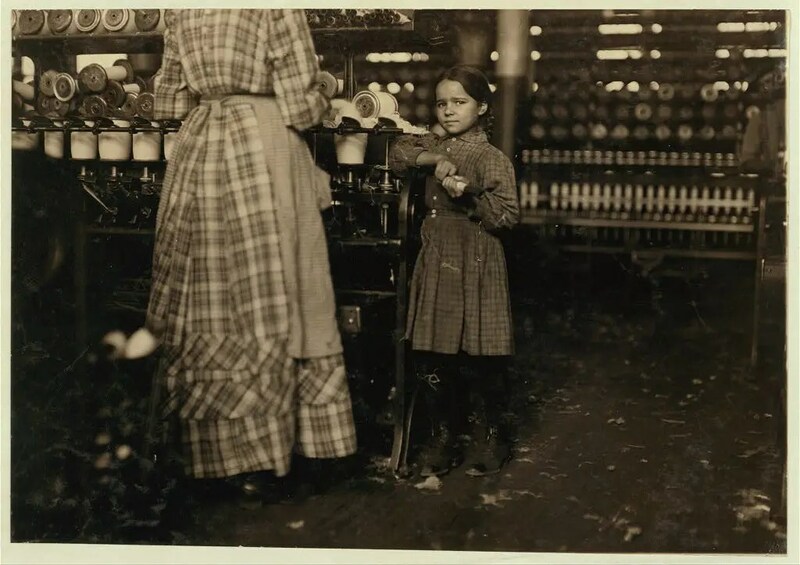 Nan de Gallant, 4 Clark Street, Eastport, Maine, a 9-year-old cartoner, Seacoast Canning Co., Factory No. 2. Packs some with her mother. Mother and two sisters work in factory. One sister has made $7 in one day. 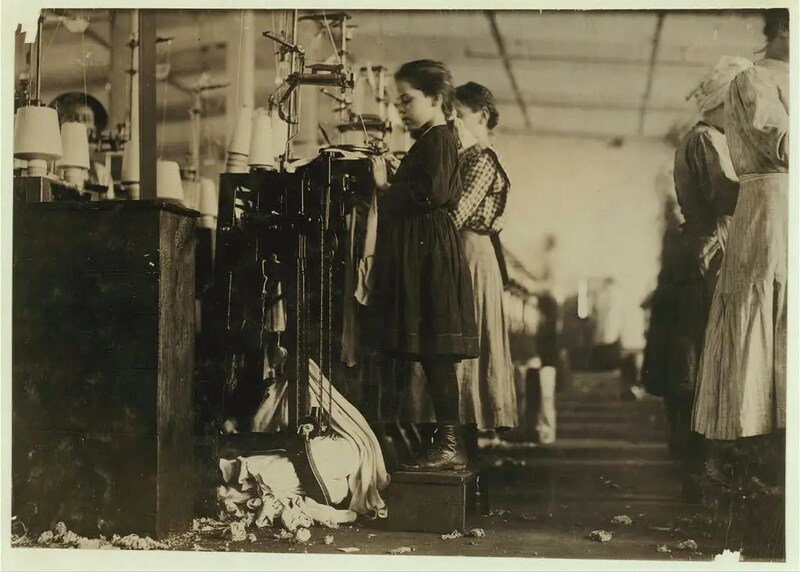 During the rush season, the women begin work at 7 a.m., and at times work until midnight. Brother works on boats. The family comes from Perry, Maine, just for the summer months. Work is very irregular. Nan is already a spoiled child. 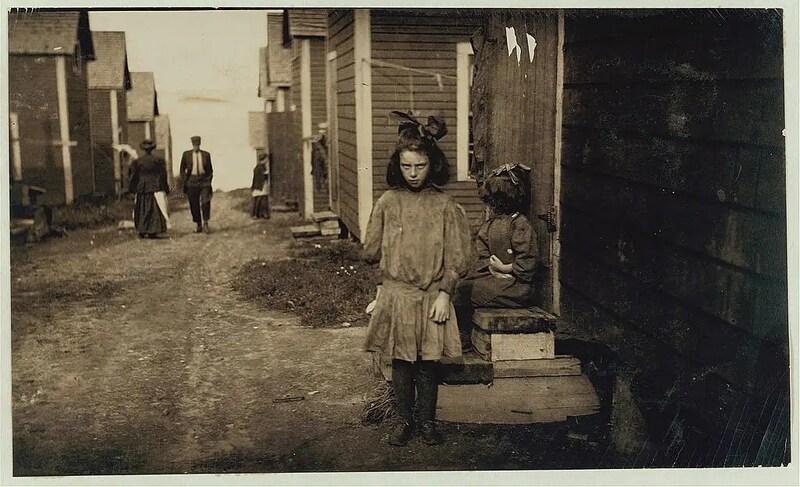 Location: Eastport, Maine, August 1911. 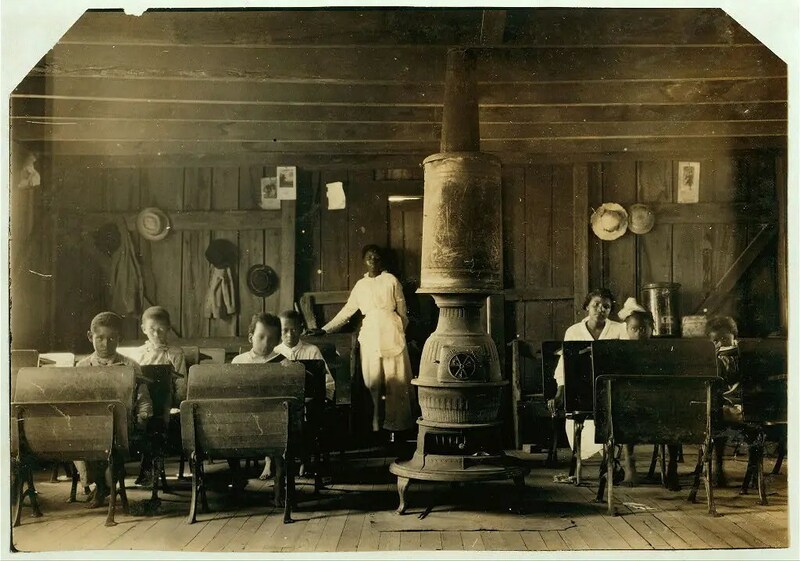 A “colored school” at Anthoston. Census 27, enrollment 12, attendance 7. Teacher expects 19 to be enrolled after work is over. 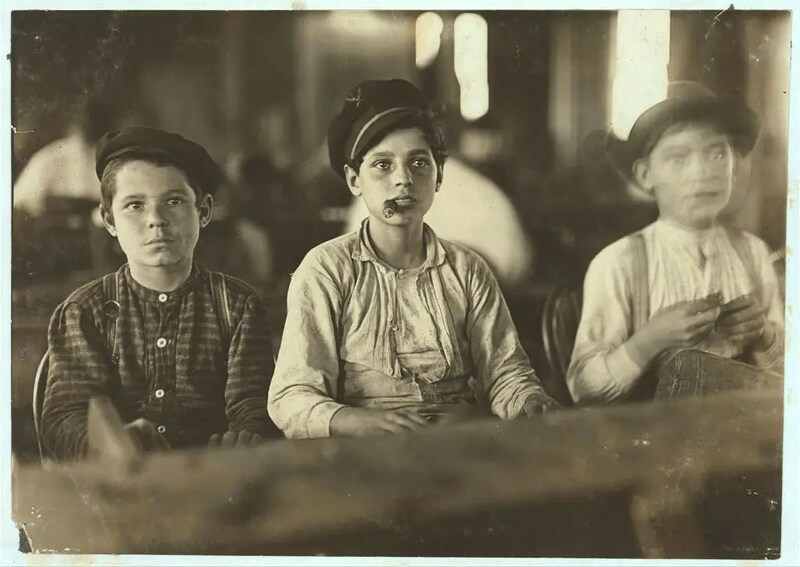 “Tobacco keeps them out and they are short of hands.” Location: Henderson County, Kentucky, September 1913. 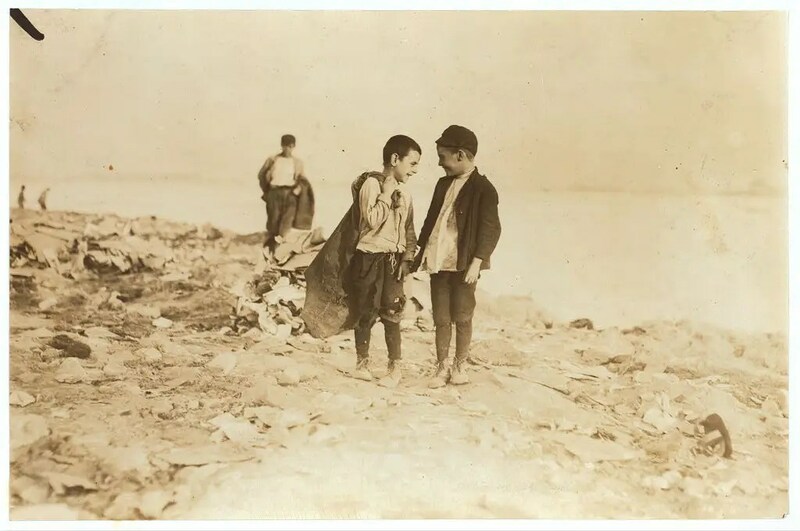 Boys picking over garbage on “the Dumps.” Location: Boston, Massachusetts, October 1909. PARIS (Reuters) – Riot police fired teargas and water cannon at protesters marching on Thursday in France against labor reforms in what unions say will likely be the last demonstrations to try to overturn the law. Scuffles broke out in Paris and the western city of Nantes. Hooded youths hurled bottles, beer cans and on occasion makeshift firebombs on the fringes of marches against the law that will make hiring and firing easier. Police said between 12,500 and 13,500 marched in Paris. More than a dozen people were arrested. Police representatives said about five police were injured. To the governments of the world: You must treat your laborers fairly or your corporations will come down around you. In any country, workers banning together can bring a government down. Walk away from the greed and the feeling that you are better than the human beings working for you. We all deserve a decent roof over our heads, clean food, clean water to drink. We deserve educations and time in our lives to be people, the people we were created to be. It is not fair to look at workers just as a means to an end; the end being you get to live well, while the workers are still living below the poverty line. Every human being has a right to a decent life and to dream dreams. Have things improved? Yes. Do they need to improve more? Yes. Do workers have a right to protest? Yes. They do if no one is listening to their demands and requests. They do not deserve to be attacked by police. Workers need to be treated with respect. The 1% wouldn’t get far without the rest of us. 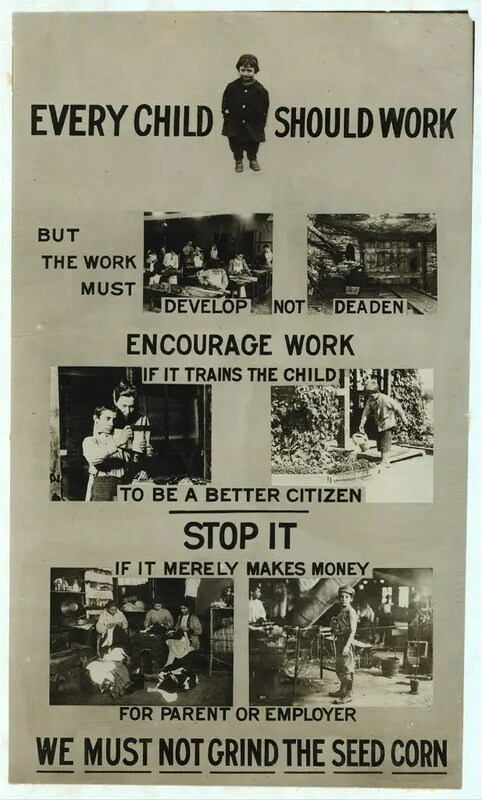 This entry was posted in Rebel Posts and tagged greed, labor, protests, unjust, work together, workers.